Sustainable Living Ottawa East is hosting its first reptile and amphibian survey along the Rideau River Nature Trail. The goal is to discover the rich diversity of reptile and amphibian species living in the community, so further action to protect these species can be taken as well as to preserve the health of the Rideau River shoreline. This event will also help SLOE build stewardship within the neighbourhood. This event will be a fun and educational experience for the whole family. Sat May 14, 9 am - 12 pm and 9 - 10 pm. Sat Jun 18 9 am - 12 pm and 9-10 pm. 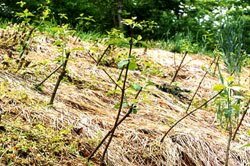 Bioengineering is erosion control using live cuttings of willows and dogwoods to help stabilize banks and revegetate shorelines in areas where tree planting will wash out. It is an alternative to using harder structures, such as rip rap, gabion baskets, armourstone, etc. Layers of soil are wrapped in coconut fiber to hold them into the bank. Live cuttings of willows and dogwoods are used to create a fascine (tubular structure) placed along the water line, and live cuttings are then placed between the layers of wrapped soil. Shrubs are then introduced at the top of slope. Link to Ontario Streams for a more detailed description of fascines. Here is a link to a report on a bioengineering project for Graham Creek in Ottawa. Read this 2011 post about riparian buffers and the three levels of stream restoration.